Sometimes we are all so busy running around our cities that we don't stop and take the time to appreciate the small details that make our home towns so pretty. Recently the fabulous Cassandra of Coco + Kelley came to town and we took a little walking tour. It was so much fun to have an entire day to wander around the neighborhoods and just soak in the architecture. Every few yards we would stop and stare at a gorgeous building which was promptly followed up with a long sigh of "awww I wish I lived here"! 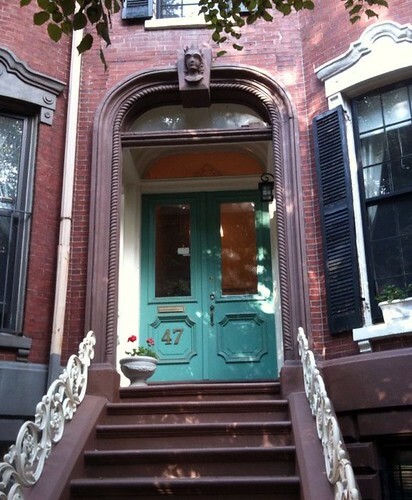 This doorway in the South End of Boston is one of my favorites and I thought Home Type Tuesday would be the perfect time to share it! A great home number can truly set the tone for the rest of your house! With the abundance of detail in this archway, this one works seamlessly. I can just imagine what the inside of the house looks like! I just recommended that paint colour for a friends front door and it looks fabulous! Now I want to paint mine that colour! The details on around this door are wonderful..
Aww, this makes me miss my little South End apt on Dwight St so much! That 'hood was my "happy place" in Boston. :) Hope you had a good time showing Cassandra around town! I love that doorway! Such an amazing color, too.